The Buffalo Sabres have traded Jamie McGinn to the Anaheim Ducks in exchange for a conditional third round draft pick. 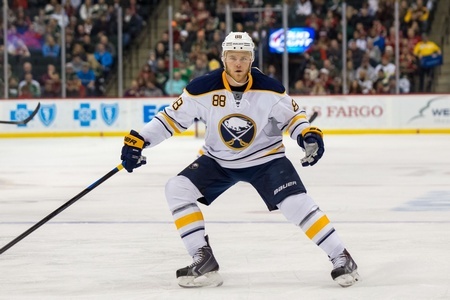 The pending unrestricted free agent was fifth on the Sabres in points, with 27 in 63 games. Buffalo was shopping him around ahead of the deadline, however, and it looks like they got what they were after. McGinn was drafted 36th overall by the San Jose Sharks in the 2006 NHL Entry Draft. He debuted in 2008 and has 429 career games with the Sharks, Colorado Avalanche and Sabres. His best season came in 2013-2014 with the Avalanche, where he put up 38 points in 79 games. McGinn plays a sound defensive game and should help round out the Ducks in the bottom six. He brings a solid work ethic and is a versatile player, which means Anaheim should be able to use him in a number of situations. Injuries have hampered his overall development, though, and the knock on McGinn is in the consistency department. But the Ducks are assembling a winner and McGinn could be a small but significant piece of the puzzle. He has 29 games worth of playoff experience with the Sharks and Avalanche and should adapt well to the system in California. As for the conditional draft pick, it appears that the third round selection will become a second round selection if the Ducks win two rounds of the playoffs and if McGinn plays for at least half of the games. It’s a similar condition to the Kris Russell deal from earlier and sets up a reason for Sabres fans to cheer the Ducks. McGinn did enjoy playing in Buffalo, even if it appears the Sabres didn’t have a long-term plan for his services. General manager Tim Murray wasn’t interested in his services and the gritty winger wasn’t the best fit for this rebuilding franchise.